Cycle Provence and enjoy fine food and great wine! This bike tour in France takes you through the premier attractions of the beautiful Luberon region as well as the magnificent Alpilles Mountains, and the great Côtes du Rhône vineyards. The small villages, age-old architecture and exquisite scenery have made this region one of the best cycling and sightseeing places in France. From the comfortable saddle of your bicycle, you will come to personally experience the intricate culture of this rich region at your own pace. You’ll cycle off the beaten path - far from the main roads, from Gordes to Les Baux de Provence, from Fontaine de Vaucluse to Châteauneuf du Pape, from Venasque to Roussillon - all the while enjoying the intoxicatingly fresh air and mesmerizing rolling hills so filled with history and tradition and ripe with color - of which artists including Vincent van Gogh and Picasso have taken full advantage. 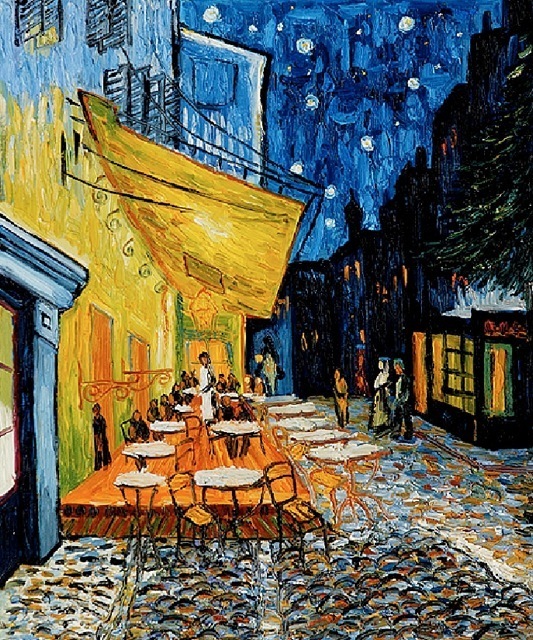 (See also Provence-Luberon and Provence-van Gogh tours). 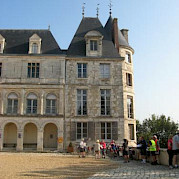 Want to see more bicycle tours in France? *Please note: All pricing listed above only applies if the start and end of the tour take place during the months listed. 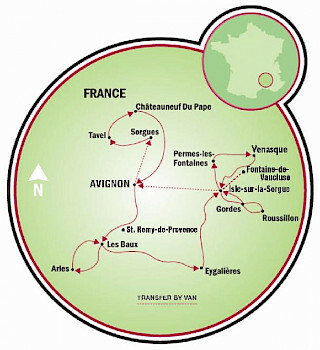 From Paris, train transfer from Paris’ Charles de Gaulle airport via Paris-Lyon station to Avignon (TGV), 3-4½ hrs. depending on connections. Taxi or Navette (shuttle bus) to the first hotel. Please note that you must be able to change your own tire. There is no immediate technical assistance for this tour. If needed, a repair or replacement bike will be available the following day. Also available as a ROAD BIKE TOUR. This self-guided hotel tour is being given an easy to moderate rating by Tripsite’s own resident cyclist, Hennie. She does concede that while there are some difficult climbs, it should not discourage anyone from taking this tour as she states it is a very beautiful tour and a favorite amongst her cycling group. Her daily rating is included in the day to day details. Daily distances range from 22 to 36 mi., but are variable. Unfortunately, there are days when traffic cannot be avoided due to lack of designated bike paths. Day 4 may be used as a rest day. Please do not hesitate to call us if you need further details. Remember, electric bikes are always an option! *Luggage transfer between 9:30 am and 5 pm. **The clients who wish to receive their luggage at a specific time, during the tour or in Avignon at the end of the tour, will have to specify when booking. A supplement will be invoiced. Extra nights in Avignon possible upon request. Daily arrivals possible from April 1 to October 25, 2019. Note: This tour is also available as a road bike tour. Arrival in Avignon. Free afternoon to explore this great city - followed by a welcome meeting in the evening at the Provence Bike Shop for presentation of the tour, distribution of documents and bikes. This day is dedicated to wine discovery: the “Tavel”, first rosé in France, and the “Lirac”, with its rare elegant quality (optional). 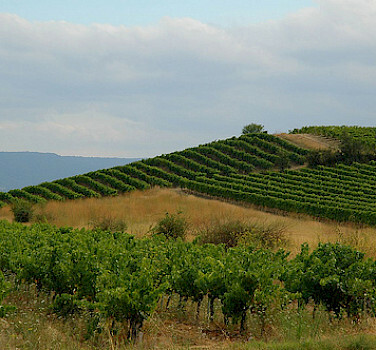 The “Châteauneuf du Pape”, a vintage wine, is specifically grown on a ground covered with pebbles. These pebbles accumulate heat during the day and give it back during the night. This wine is also unique because it is made from 13 different varieties of vine. 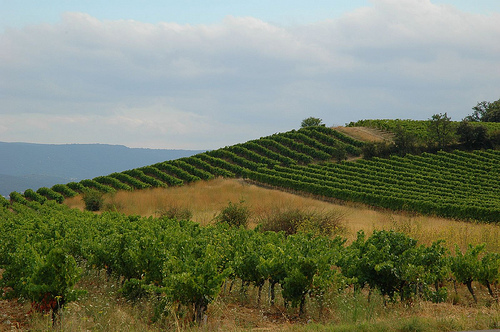 From the small village of Tavel, which is comfortably surrounded by lush vineyards, you will travel on to Châteauneuf du Pape. Here you will find the ruins of the Castle that served as a comfortable summer residence for the Popes. Via quiet country roads, you will next make your way back to Avignon. *Easy to moderate cycling day. +/- 242 meters of climbing or 318/402/481 corresponding to the longer distance options. Heading south towards the very heart of Provence, you will ride into the foothills of the Apilles Mountain range (with low altitude fluctuation). 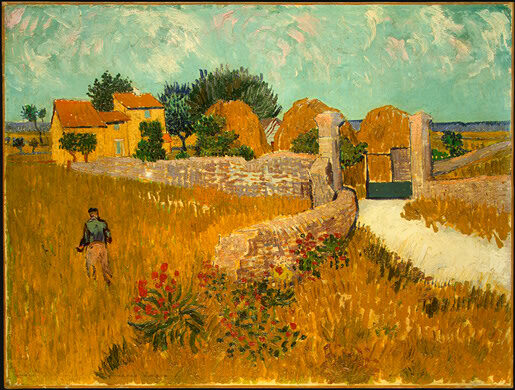 The landscape is made up of small hills with chalky ridges that love to soak under the sun, and where you can easily see why painters such as Vincent van Gogh found their inspiration. In St. Rémy de Provence, where Nostradamus (the doctor and astrologist famous for his predictions) was born, you will come across 2 well-preserved Roman monuments: the Mausoleum and Municipal Arch. St. Rémy de Provence was once a rich Glanum city, abandoned at the end of the 3rd century and now only ruins remain. 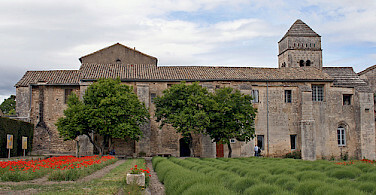 As you bike on to Les Baux de Provence, stop to enjoy “l’elixir (liquor) du Révérand Pére Gaucher” in the Abbey of St Michel de Frigolet. It is situated on the “Montagnette”, a small mountain (highest point 170 m). 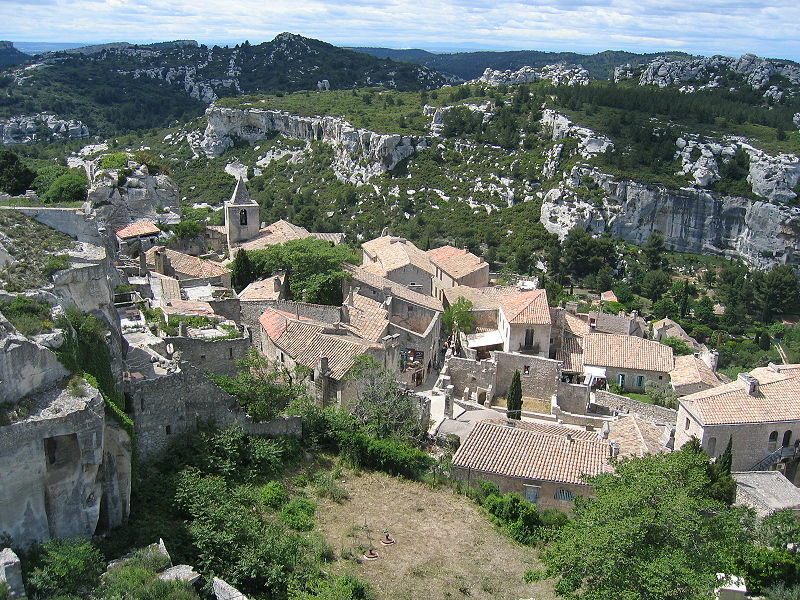 Overnight in Les Baux de Provence. *Easy to moderate with difficult climb to Les Beaux. +/- 523 meters of climbing. 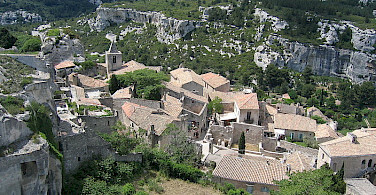 Three options are given today: resting time at the hotel, visiting the village of Les Baux de Provence, or biking for about 32 miles on flat ground that includes a visit to the wonderful town of Arles. The village of Les Baux de Provence, with its charming houses all strung together, sits cozily on a rock where the view is magnificent: groves of olive trees flow across the plains, cypress trees stretch toward the sky, fields overflow with beautiful flowers, small villages pepper the landscape, and of course, there's the endlessly blue waters of the sea to deal with. Arles, a ancient Roman capital and large religious center during the Middle Ages, has brilliant houses surrounding its arenas, which are perhaps the city's most captivating feature. Every Saturday morning, the city streets transform into a bustling open market. 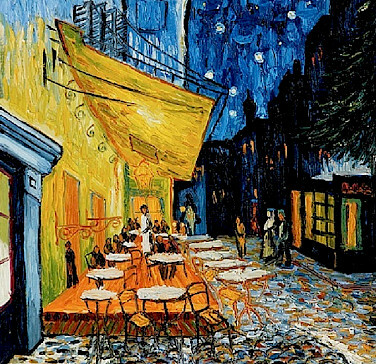 In the heart of the old city, you may relax at numerous refreshing outdoor cafés. Overnight in the same hotel. Today, you'll start by crossing the small hills of Les Alpilles (highest point: 390 meters). En route, delightful villages will await your acquaintance. 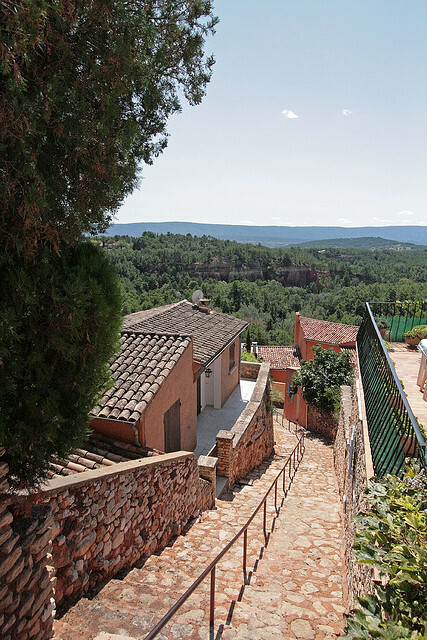 In Eygaliéres alongside a hill of donjon vestiges, you will be able to take a break at the foot of a 12th century Chapel, where it used to be a heathen temple dedicated to water. Next, you'll head east along quiet roads to the Monts de Vaucluse, reaching the heart of the regional park of the Luberon. Overnight either in Fontaine de Vaucluse or in Isle sur la Sorgue, on the riverside. At the foot of a golden cliff flows one of the most important springs in Europe: the Fontaine de Vaucluse. This site is famous for its breathtaking natural atmosphere, and is also known thanks to the Italian humanist and poet Pétrarque from the 14th century. 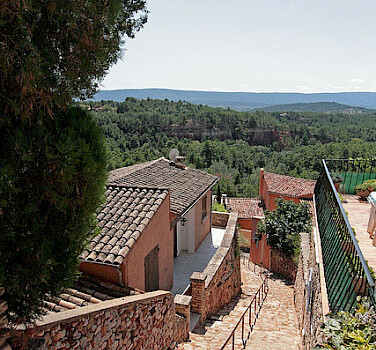 Further on, two villages are worth a visit: Gordes and Roussillon. Gordes has attractive stone houses and nicely paved, arched streets. 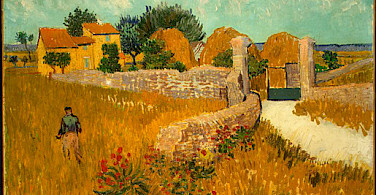 It is hung up on a cliff at the start of the Luberon chain. Around the villages are numerous “Bories” (huts made out of dry stone) that will amaze you with their various shapes. 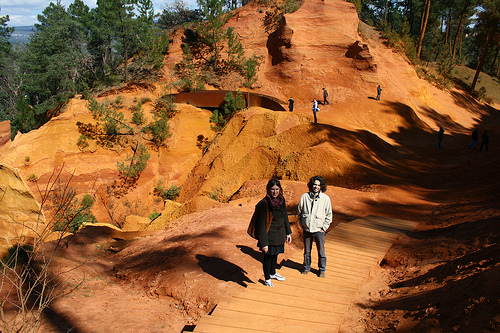 Roussillon, a totally different village, sits on a small hill colored with red ocher. The house walls are stained with ocher, from red to yellow, contrasting nicely with the dark green of the pine trees. 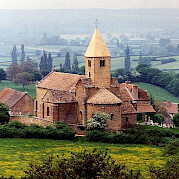 At the top of the village, a viewpoint offers a spectacular view over the plains, Gordes, and the small villages around. Overnight in the same hotel. *Easy to moderate with difficult climb to Gordes. +/- 800 meters of climbing. The big village of Isle sur la Sorgue is surrounded by the arms of the river and becomes animated every Sunday morning when a famous antique market as well as a large Provencal market take place. In every street of the village, there are booths with shimmering colors, stimulating odors, Provencal cloths, handicraft, clothes, pottery…. 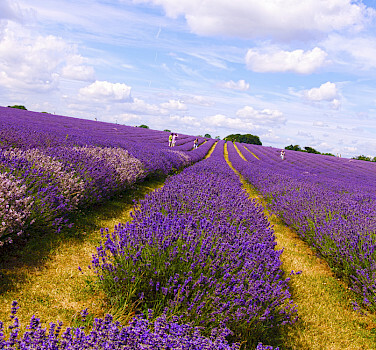 Vegetables, sweets, delicatessen, goat cheese, honey and jam… lavender, spices, Provencal herbs… exuberance, laughing, hustling… All meridian culture is here! 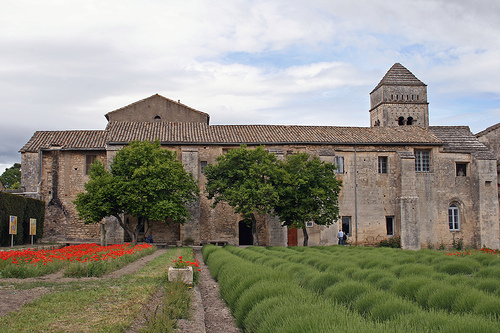 Escaping north, you'll next bike on quiet country roads to reach a pleasant village located on top of a hill that overlooks the plains of Carpentras; namely Venasque. The village presents magnificent views also over Mont Ventoux, the highest point in Provence (1910 m high). Night in the same hotel. *Easy to moderate. +/- 634 meters of climbing. DAY 8: Transfer Fontaine de Vaucluse/Isle sur la Sorgue to Avignon. Departure. 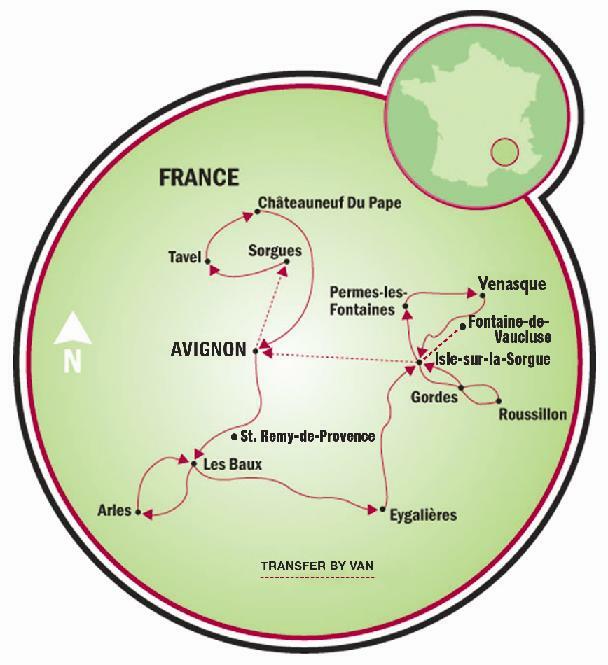 A short transfer to Avignon is included in the tour price (9 AM to 6:30 PM). A supplement will be required for departures before 8 AM or after 7 PM or for transport of your own bicycle. My trip was the Villages of Provence. A wonderful area to bike through. I would suggest that the orientation be set for a determined amount of time to allow for complete question and answer time. Also it would be helpful to go through the use of the GPS thoroughly. The bike maintenance was not done prior to our week long trip. The tail light and the computer on my bike did not function properly. All in all the hotels, service, food, and ambience were wonderful. I’d highly recommend this trip to intermediate to advanced cyclists. We absolutely loved the two villages we stayed in and many we rode through along the way (our trip was shortened). The French have a way of sharing their “Joie de vivre.” We'd never been to Provence, and the olive groves and apple orchards, the adorable small towns, the food and wine, eating our picnic lunch in an ancient, empty church foyer— all made for an unforgettable adventure. My only suggestion is to make sure people know how to use the GPS if they are their own guides. It was confusing for us but we eventually figured it out. Lucky are those that can take this trip! Accommodations faultless. Bike company efficient and I loved my bike. Maps very inadequate, we should not have been on "on ramps" to or navigating 4 lane highways, check out the maps through Cavaillon for example. More moderate than recreational cycling especially the hills. Great on an E bike if you had one. Scenery exquisite. Weather too! Thank you to Mary for organizing or extra nights in Avignon, another great hotel. "easy to moderate" was at the outset incorrect, it was "moderate to difficult" when one considers the length and incline of the hills. Also, our group of twelve experienced 3 flat tires, the first time in many years of biking in Europe, and each was on an e-bike. The hotels, on the other hand were exquisite! This tour should be rated moderate/difficult. There are many steep climbs. I had an E bike so not bad for me. The non E bikers had a big job. If everyone had an e bike, a very enjoyable journey. The scenery was gorgeous. The hotels were beautiful and welcoming. The maps provided by the trip organizer and rather GPS could have been more detailed. 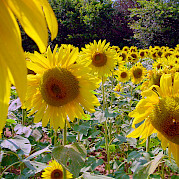 The most memorable part was beautiful scenery, especially the magical villages we rode through in Provence. At the start there was mix-up with our believing we were in Option A (written on receipt) but placed in Option B. Small issue but a surprise. Otherwise, maps worked fine once more used to the + or - aspect figured in to almost all mileage. We had a wonderful time! Overall a great experience. The E bike introduction and explanation of use was rescheduled, then rushed so our group was at a disadvantage throughout the hill climbs. Some road sections were highways and quite honestly dangerous for short segments. This was our second trip and directions at one point or another usually are unclear periodically throughout the trip. Somewhat inadequate initial bike instruction due to bike shop rescheduling at their convenience. Bike maintenance was only average causing the bikes to not operate as described. 2. We did not get our bikes at the welcome meeting. One Ebike had not yet returned on Saturday afternoon. We were told to return in the morning but not before 9:30 AM. When we arrived, we felt rushed and really didn’t have time to test the bikes. Mine (Ed) was a bit wobbly but Read more… I was told that there was nothing wrong. I did get used to it as we went along but my complaint was valid, further verified when I returned home to my own steady bike. 3. All of the bikes had problems with how they shifted and how they meshed with the electric function. Maybe it was our lack of familiarity with the Ebike but we really didn’t have time Sunday morning to ask questions. 4. We never got an explanation on how to engage all of the 27 gears, only could use nine. We were told that they shifted automatically and “don’t worry about it”. The automatic shift stopped working on two bikes after the second day. 5. The directions were very confusing and hard to follow. Last year we had the “E’s” to follow but this year nothing but the somewhat confusing directions. Thank you for sharing this feedback! We are very sorry you felt rushed in the welcoming meeting and bike fitting. We have spoken to our local operator to prevent this from happening again. I can assure you that the bikes have been tuned and are maintained to the highest quality! This was our second trip with Tripsite. 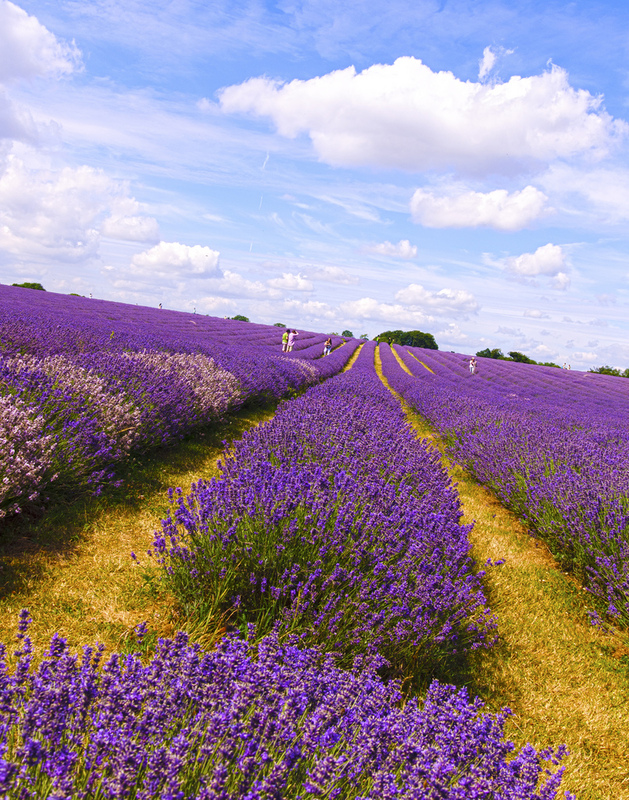 We did this trip to Provence in early September and it really was magnificent. The local tour organizer had a well prepared and thought out package with easy to follow directions for the most part. The cycling with the accompanying scenery was beautiful. The accommodations and food were well selected. We can't recommend a trip more highly than this (except possibly the trip to the Netherlands we did last year) or this group. This was a beautiful trip, with lots of nice surprises (changing sceneries, nice food, etc.) The local tour organizer was a sweet lady who treated us like old friends. 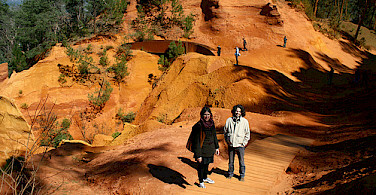 We really had fun and suggest this tour to whoever is looking for simple adventure in pretty France.